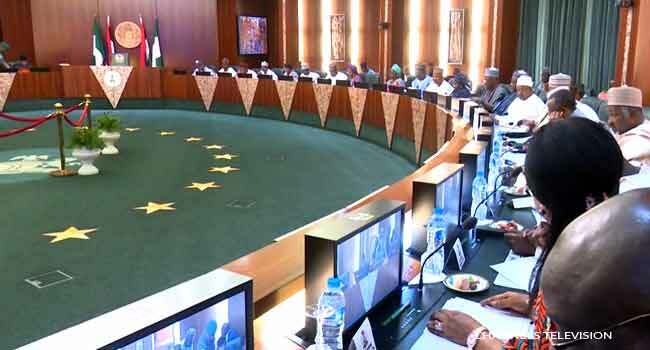 A file photo of the National Economic Council (NEC) meeting held at the Council Chamber of the State House in Abuja in January 2018. The National Economic Council (NEC) would meet on Friday next week, to review the performance of the nation’s economy from January 2018 to date. This is according to the Chairman of the Nigeria Governors’ Forum, Abdul’Aziz Yari of Zamfara State who briefed State House correspondents on Monday in Abuja. Governor Yari made the disclosure after he led governors of Borno and Kaduna, Kashim Shettima and Nasir El-Rufai, to meet with Vice President Yemi Osinbajo behind closed doors. He further gave an insight into measures being put in place by the government in Zamfara to address the security challenges in the state. Yari explained the reason behind the deposing of some traditional rulers in the state, citing alleged complicity with armed bandits and the need to fish out the culprits. He revealed that the state government has engaged intelligence expert for investigations, stressing that more traditional rulers would be dismissed if found culpable. “What we are trying to do is to teach a lesson because the problem we have in Zamfara State in the north-west is a kind of peculiar problem that some of the traditional rulers are supporting the banditry activities or taking advantage or taking money from them or relationship; that is very dangerous,” the governor said. He added, “Any one that we find wanting in this, definitely he must face punishment, and we are trying to use every avenue that we have to ensure that we fish out those that are within us – within the traditional rulers and outside. According to Governor Yari, the government engaged about 2600 people in its resolve to tackle banditry, but this is not enough because the people are strange to the terrain. He said they have, however, employed indigenes who would lead the security agencies to their doorsteps and were already getting positive results.